(1) Leaving the eastern approach to the Fords defended, Théodred rides north to meet an oncoming army from Isengard. 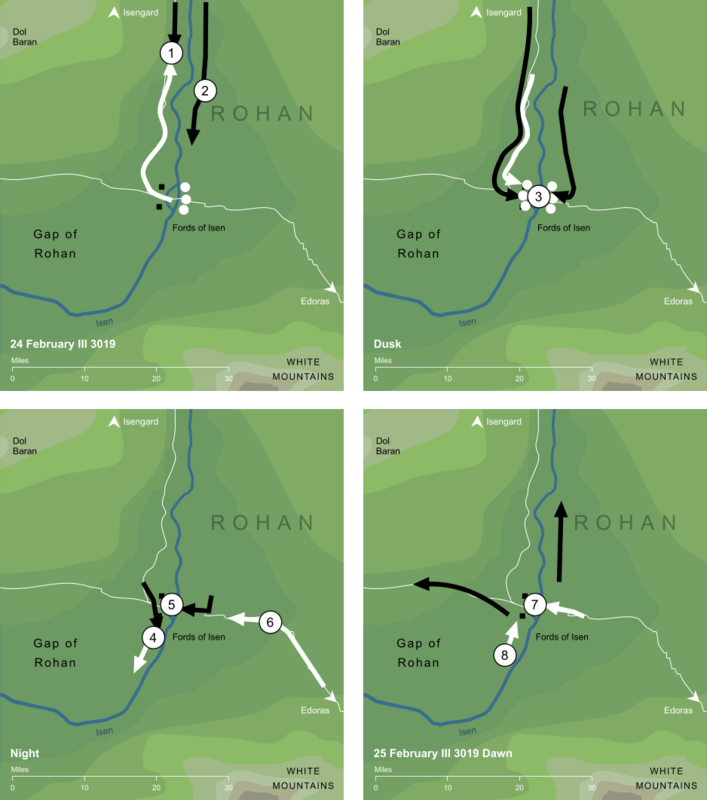 (2) Saruman sends a second force down the eastern side of the river; seeing this, Théodred disengages and rides south again to defend the Fords. (4) The defenders on the west bank of Isen are swept southward along the river. (5) His defence all but gone, Théodred is driven to the peak of the eyot and mortally wounded. (6) A force of Rohirrim under Elfhelm, having encountered outriders of the eastern Isengarders, charges the Fords from the east. (8) Returning to their position, the western defenders find that their pursuers have withdrawn,3 leaving the Fords temporarily in the hands of the Rohirrim. The assault by Saruman's forces on the Rohirrim under the command of Théodred, Grimbold and Elfhelm. Théodred the King's sole heir was slain in the attack, and indeed it was later discovered that this had been Saruman's main purpose - after Théodred's loss, his armies withdrew. At the Fords of Isen, the river Isen split briefly into two shallow branches, flowing around a large 'eyot' or river-island. It was to this central eyot that Théodred retreated, and on which he was ultimately slain. The Tale of Years gives the date of the battle, and of Théodred's death, as 25 February III 3019. This raises some minor difficulties of dating, as the battle actually took place over two days, ending near dawn on the second of these. Since Théodred died of his wounds at the close of the battle as Saruman's forces withdrew, we take the date given in the Tale of Years as the date the battle ended, so that the actual engagement must have begun on the day before, 24 February. One aspect of the battle that is not recorded in detail is the withdrawal of Saruman's western force, since it took place in darkness and was not observed by the Rohirrim. All that we know for sure is that a horn was heard to sound, after which the western companies of Riders, making their way back northward along the river, found that their foes had vanished. In the Second Battle, fought seven days later, a force of Uruks charged into the battle from the west, so we assume here that this was the withdrawn western force (known to have been composed of Uruks), and therefore that their withdrawal from the First Battle was to the west, rather than back to the north as might otherwise be presumed.